I don’t know about you – I feel like March absolutely flew by! The heaviness of Winter is starting to fall away and there are things to do…places to go… The weather is much nicer and beckons you outside to do and see and just be out and active once more. I think I accomplished that this March! 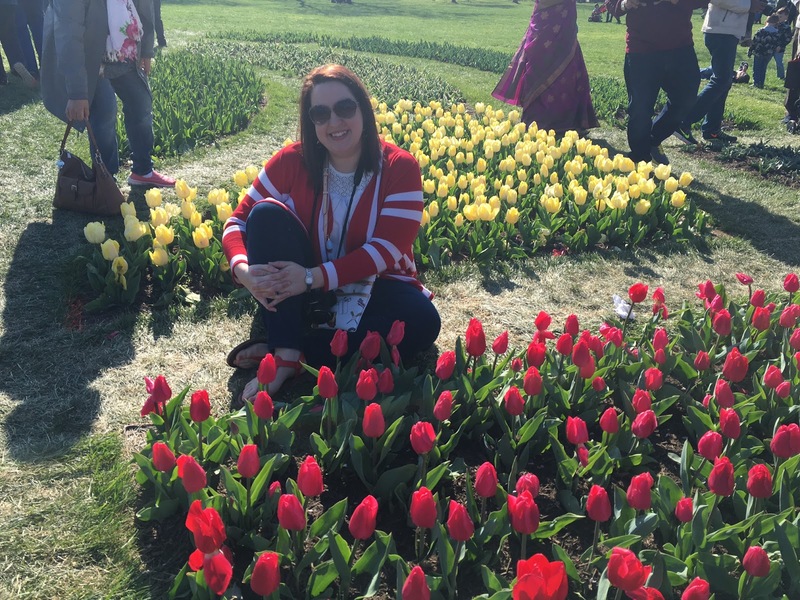 Between flying down to Mississippi, spending time with friends and finally getting back into DC after what seems like months… March was a great month; not just this year, but for so many years that have gone by. I survived “flying” the simulator! Posing for a quick snap at the formal dinner after graduation. Wine tasting at Phillip Carter Winery – delicious! Goofing off in a thrift shop – because, why not? 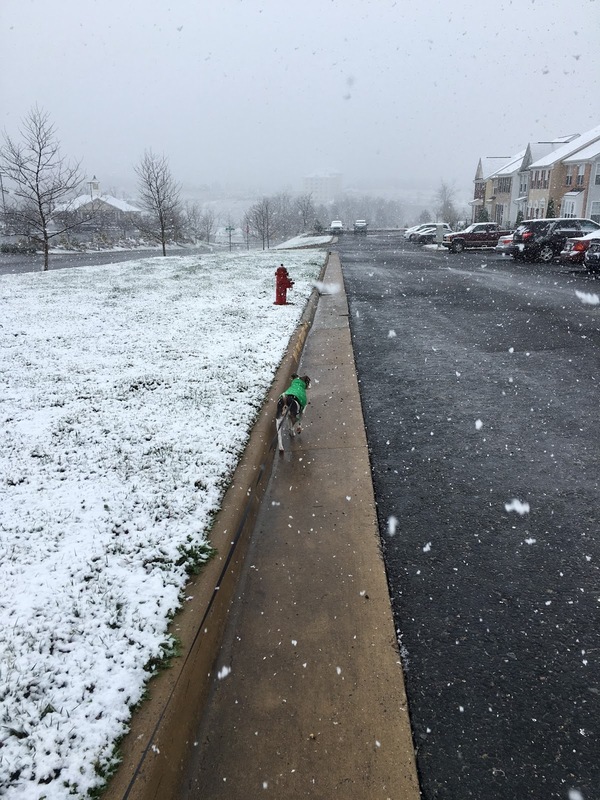 Watson looking forlorn on what I’m sure was a rainy Spring afternoon…. Friday night camera fun with Micah! Apparently this was my most liked photo on Instagram in March of 2014 – no doubt courtesy of Watson’s antics. Lunch with a sweet friend on a Spring day! Trying on hats with my partner in crime – love it! At Meems Bottom Bridge – one of the oldest covered bridges in Virginia. Food trucks and friends in Portland, Oregon! Getting in some baby snuggles with Ryleigh! Posing with the Beauty Queen after her big win! 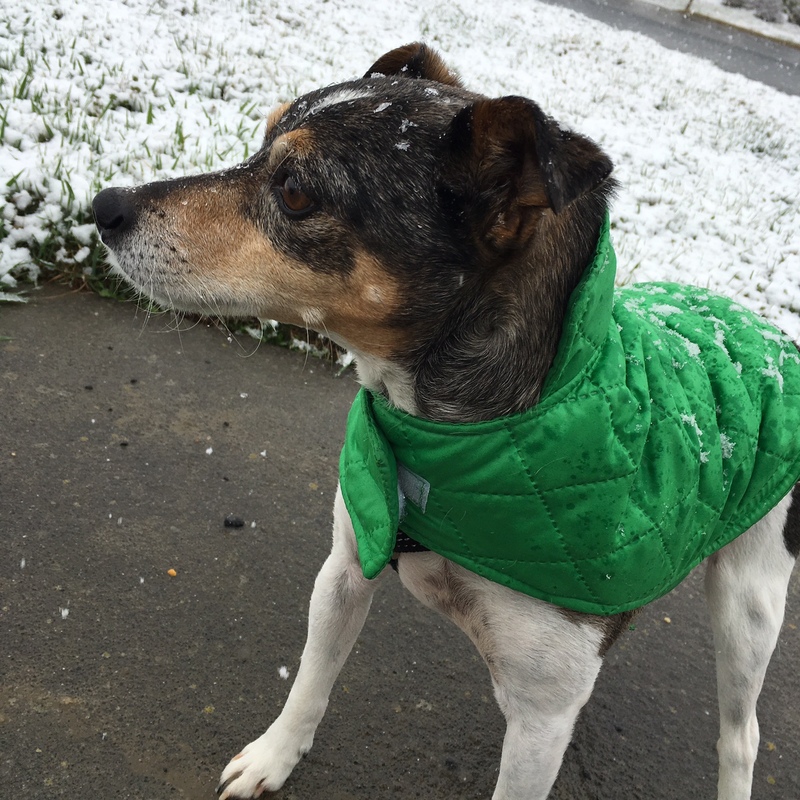 A quick snowstorm in March – in Mississippi…because why not? Home Sweet Home – in the snow. 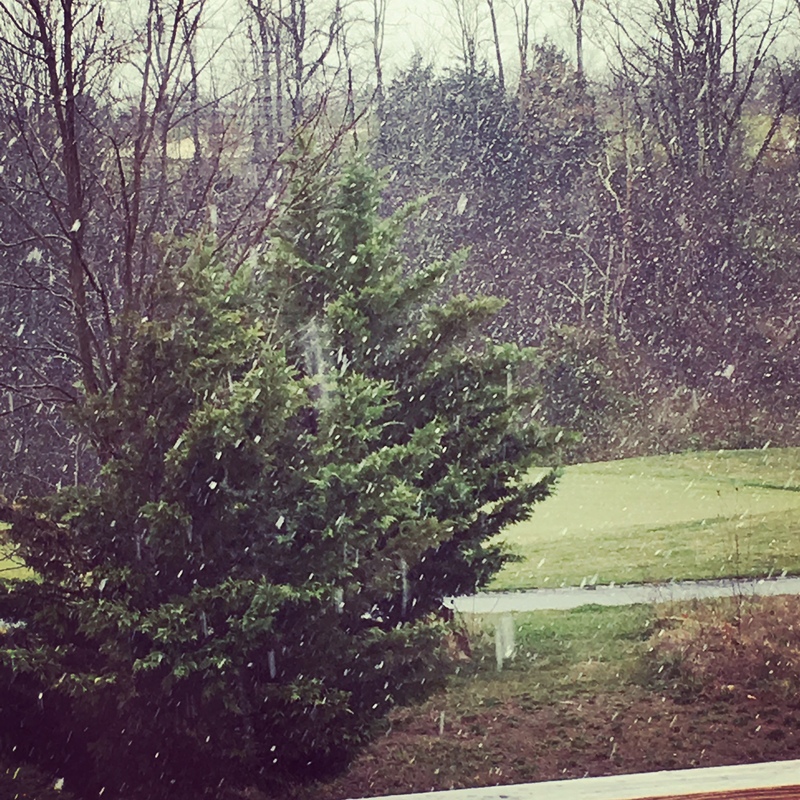 Catching snowflakes with Kristen in Gatlinburg – Spring Break! Goofing off in Cades Cove. The higher you go…the icier it is… whoosh! Having dinner with Nickolee before seeing “Aida” in Jackson. We made it to the top of Pikes Peak for the first time – don’t we all look thrilled? Lindsey’s very first visit to the Air Force Academy – ever. Spring Break! I don’t even know where we are or what we are doing…ha-ha! And then there are the pictures I have that I know occurred in a March that has long since gone by…but the years on some of them are a bit fuzzy…So…they go in the section on this post known as March(es) of the Past… Most of which include pictures of me with some serious high school realness… Cracks me up! I promise I’m not trying to squeeze her to death…ha-ha! One of the many waterfalls in the Great Smoky Mountains – check out the bow in my hair! I’ll leave you with this… I look back at some of these pictures and it makes me think: I’m not the person that the seventeen…eighteen year old girl thought I’d be at thirty-one. I think I’m still reconciling myself with that. Life is funny in that way; it never quite turns out the way you think it will. 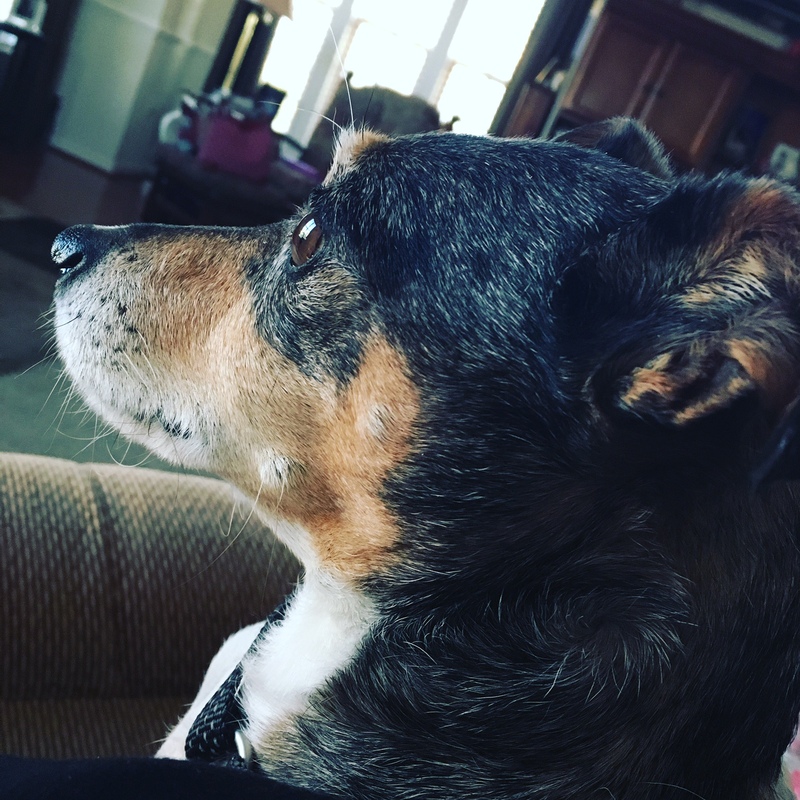 The cutest pup ever – and I’m always trying to get him to crack a smile. Okay – maybe a tiny smile…. Just kidding – teeth and all! Oh – Mission Cute! It’s like they saw that I reduced the size of my box recently and they decided they’d send one of the best boxes that I’ve ever gotten before! Man! They know how to try and reel a client back in. However, I will hold my ground and stick to the smaller box for the month of April – so this will be my last “deluxe” box. What might this box have in store? 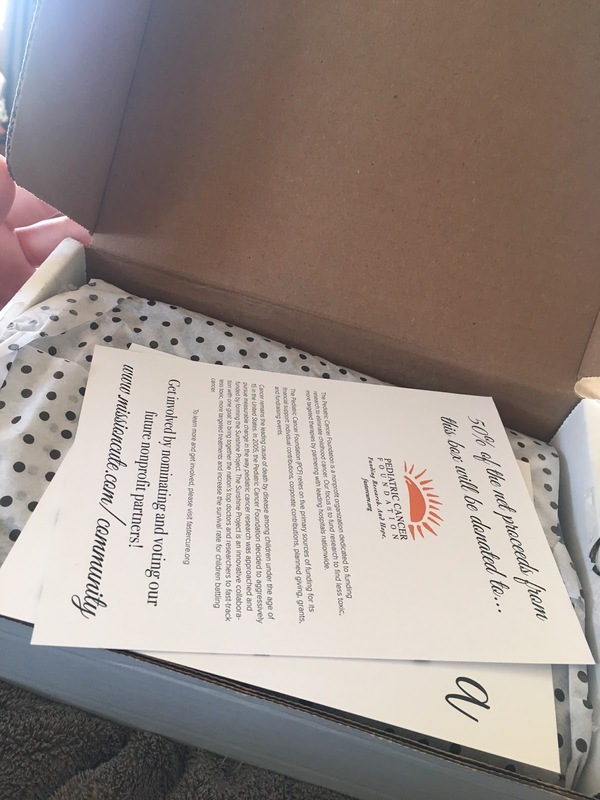 The March box supported the Pediatric Cancer Foundation – I think this has easily been one of the most well known foundations in all the time that I’ve been receiving the Mission Cute box. The Pediatric Cancer Foundation is a nonprofit organization dedicated to funding research in an effort to help eliminate childhood cancer. The Pediatric Cancer Foundation relies on five sources of funding for it’s financial support: individual contributions, corporate contributions, planned giving, grants and fundraising events. So…I guess this month’s box proceeds are a corporate contribution?? Ha-ha…regardless of what type of contribution it is, 50% of the proceeds for the March Mission Cute box went to a wonderful cause. So now…on to what was in the box…because remember, this box was great! Mission Cute Art Print – I like this print and the quote by Maya Angelou; I’m not sure where I’m going to put all these prints since I’ve accumulated about five or six now, but I guess they can be interchangeable in the frame I have. I will confess as much as I’ve loved some of the art prints, I’m hoping that they are omitted from the Mini Box that I’ll get in April…mostly because I don’t need anymore, ha-ha! 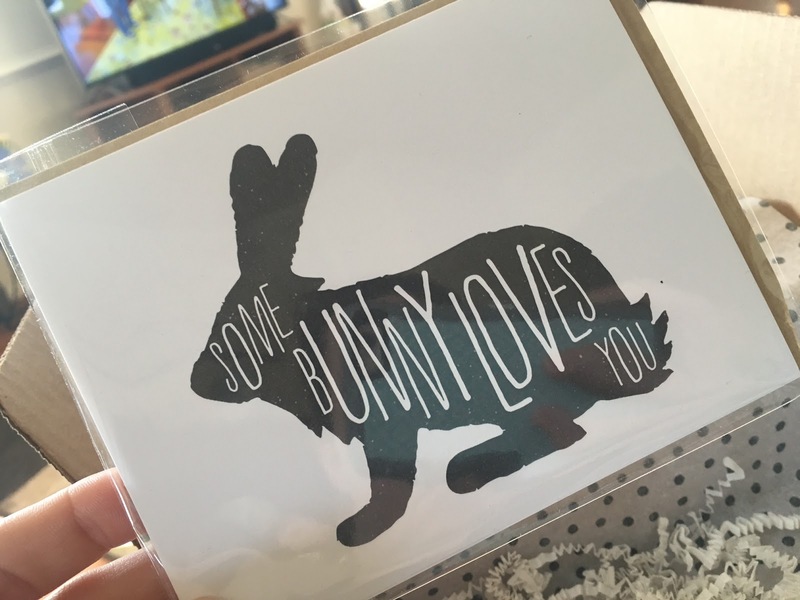 Some Bunny Loves You Greeting Card – Which I loved and immediately knew would go to my little sister for Easter! 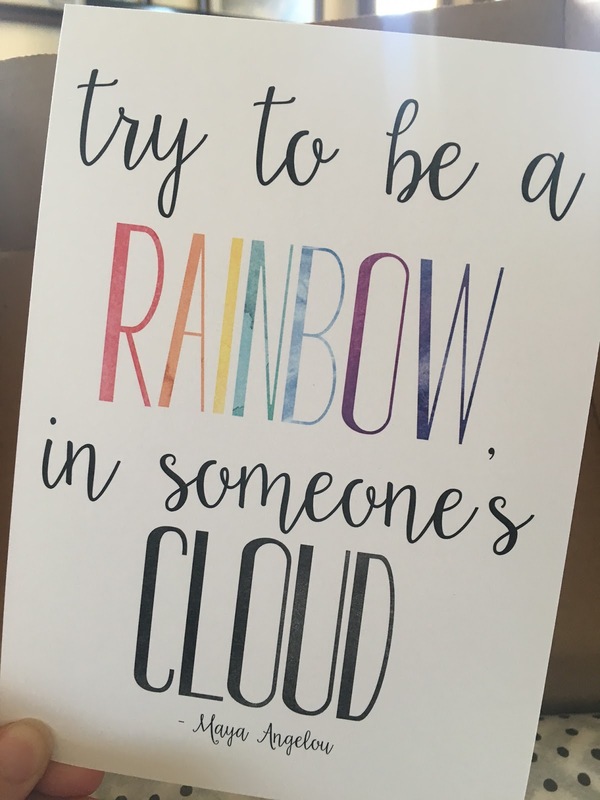 I adore the simplicity of the card and the sweet statement…and since I got this box in mid-March, I didn’t hold on to this cute card for long. I stuffed it with a little surprise for my sister and sent it along to Texas for an Easter happy! I will say; I love when the boxes have cards and stationary type items, I love those kind of things and can’t get enough of them! The next three things were what really made this box for me – I thought they were all absolutely great! 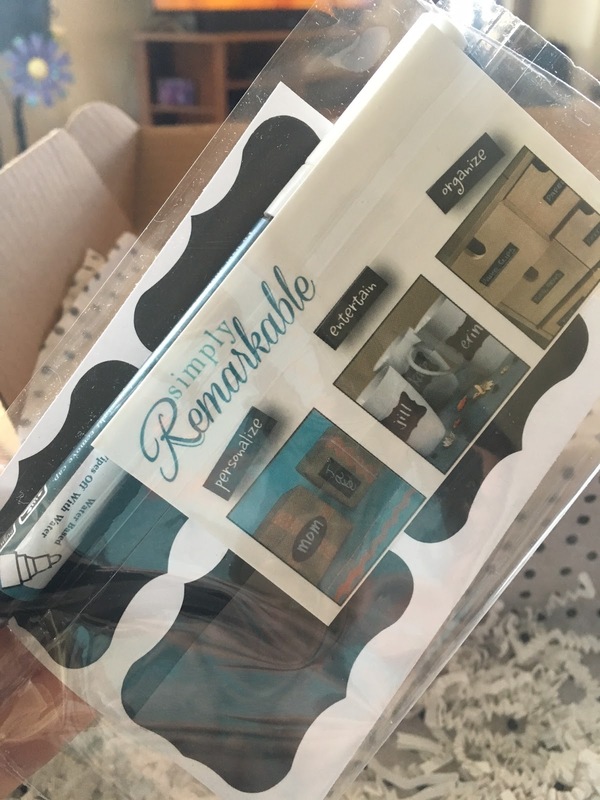 Simply Remarkable Chalk Marker – This really got me pretty excited! I have a small chalkboard sign at my office but the plain old chalk that came with it…well, it just doesn’t quite do the job! I have looked for something to write on it with but so far, I’ve not had a lot of luck! I guess maybe I need to hit up Hobby Lobby or Michael’s…but I digress. This is a chalk marker that I just know is going to come in handy for writing cute little messages on my chalk board and I can’t wait to put it work! 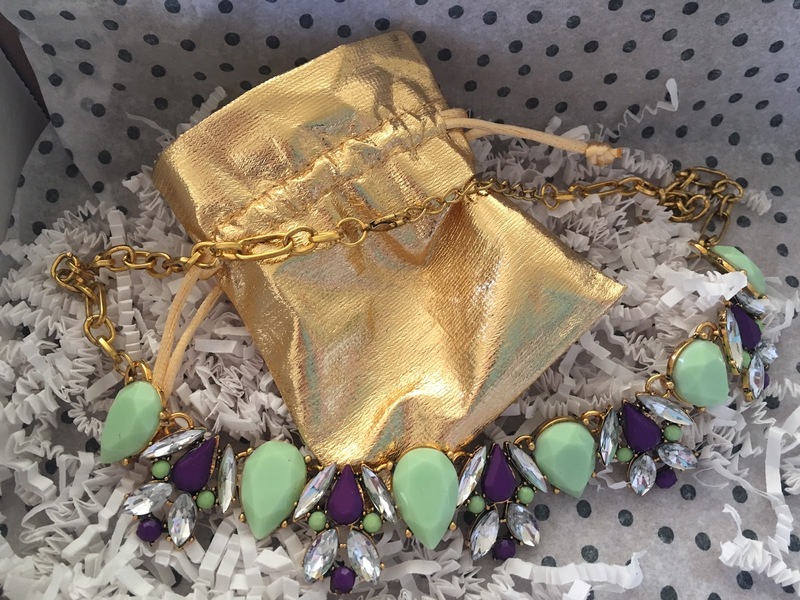 Mint & Eggplant Necklace – How cute is this necklace??? I always love when there is some sort of jewelry in the boxes and Mission Cute usually doesn’t disappoint in the jewelry department, but I have to say that this is the cutest piece of jewelry I’ve received so far! I love the mint and purple, it will go well with a lot of things for Spring and Summer! I can’t wait to find the perfect outfit to pair it with and throw it on! I also love that it’s gold; I’ve not been much of a fan of gold jewelry but recently I’ve really been on a kick with gold, so I was thrilled to get another awesome piece of gold jewelry to add to the mix! 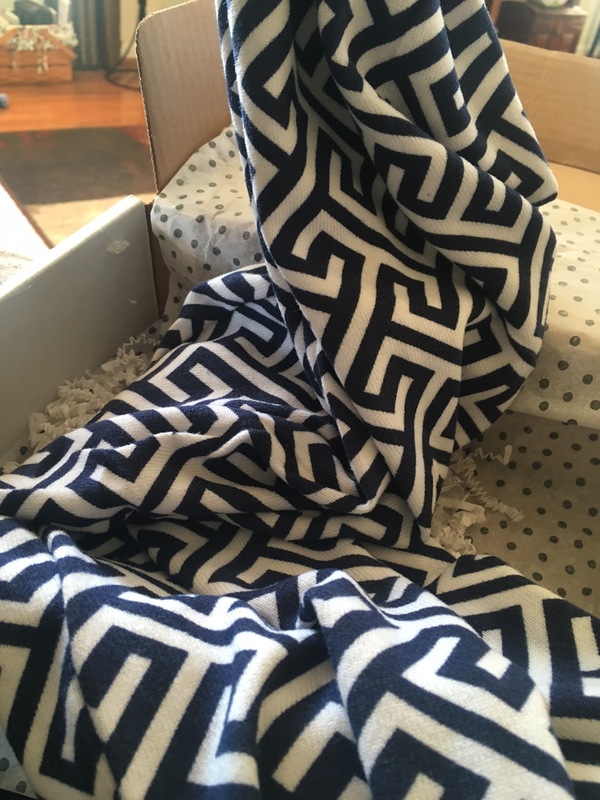 Greek Key Infinity Scarf – Oh my goodness! I love this scarf! It’s soft, I love the Greek key pattern and it could work for almost all seasons. The material is light enough to be a good Spring or Fall scarf but would also do well on a mild(er) Winter day! I think I most love that the scarf is navy and white; I really love navy and red for the Summer, I love nautical colors in general for the Spring and Summer and given that sometimes there are some early Summer days that can be quite mild here…I think I’ll get a ton of wear out of this scarf! So – there you have it! The March Mission Cute box…they did their best to try and draw me back in for the Deluxe Box. I have to say, as fun as this box was, I’m looking forward to seeing what the Mini Box is all about in April! 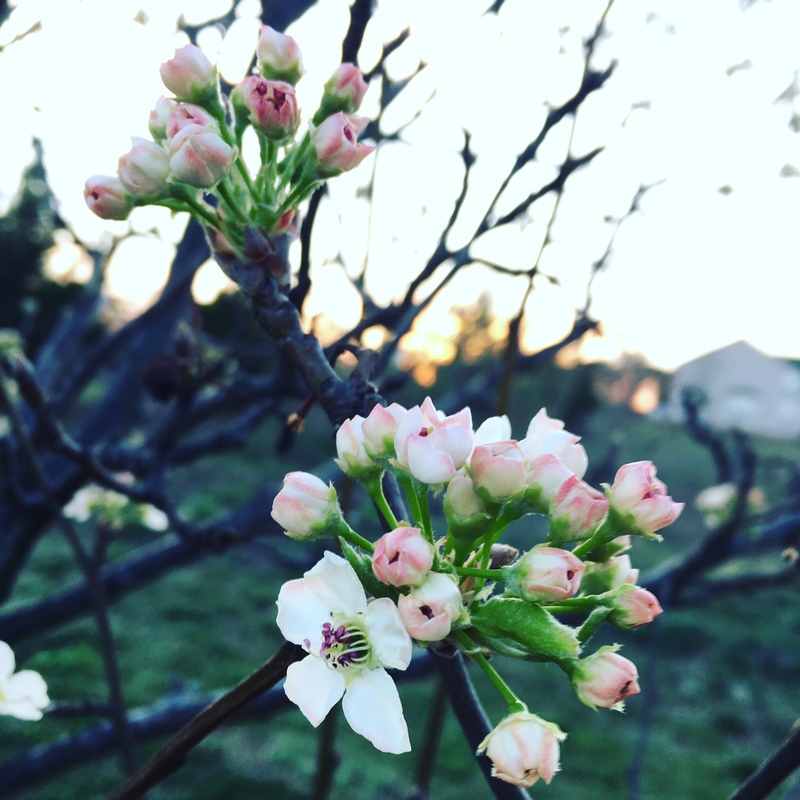 Last week was definitely the end of all things Winter – this past week seemed to be filled with blue skies, puffy clouds, trees finally budding…and blooming…and tons of March winds. I jumped back into the exercise game pretty strongly this week and although the sun was shining on Monday afternoon, the wind was whipping around at a blistering speed and I thought Watson was going to fly away! Topping the hill & hoping we don’t blow away. The earlier part of the week was pretty routine…work…home…walk…supper…be a bum for the rest of the night…sleep and repeat! 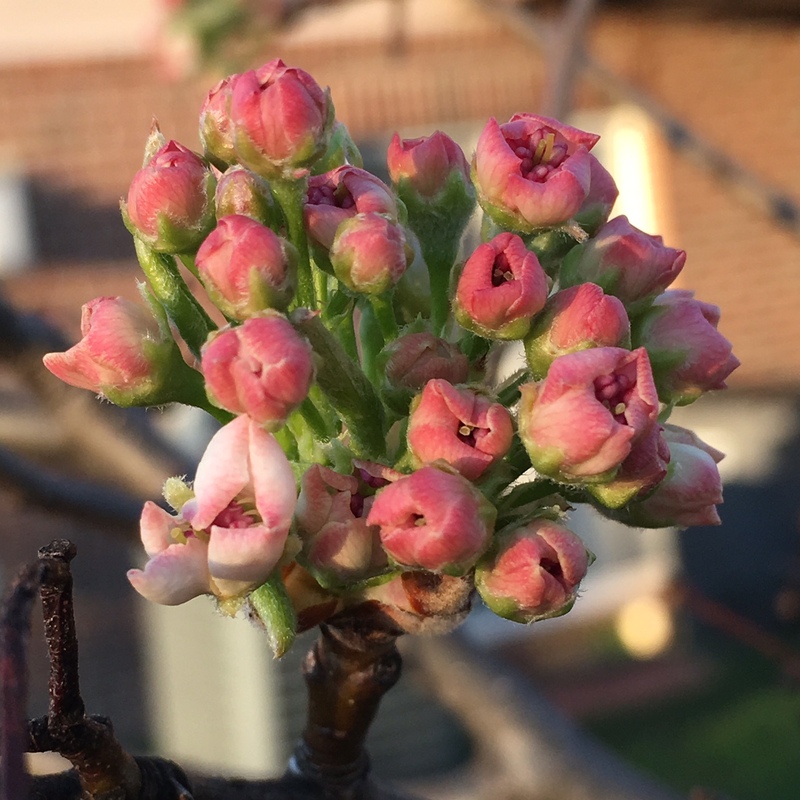 I discovered on Monday afternoon that a tree I’d been watching in our backyard had finally started to bud and so I proceeded to document them on an almost daily basis throughout the week. 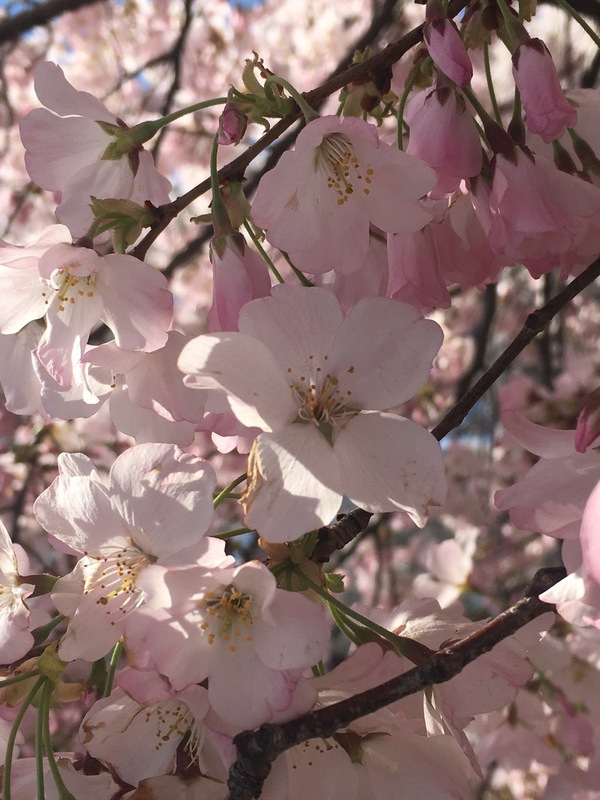 I like to tell myself that I was trying to practice my flower documentation before going to DC on Saturday to see the Cherry Blossoms…but mostly I just wanted to take lots of pictures, ha! I also was really pleased with how well the camera on my new iPhone seems to work! I only just got the iPhone 6S about a three weeks ago and the camera is supposed to be much better – so far I haven’t been disappointed – which is good since I’m pretty addicted to Apple and all their products. Granted…I’m sure now that I finally picked up one a 6S, the new one will come out tomorrow. Ha! 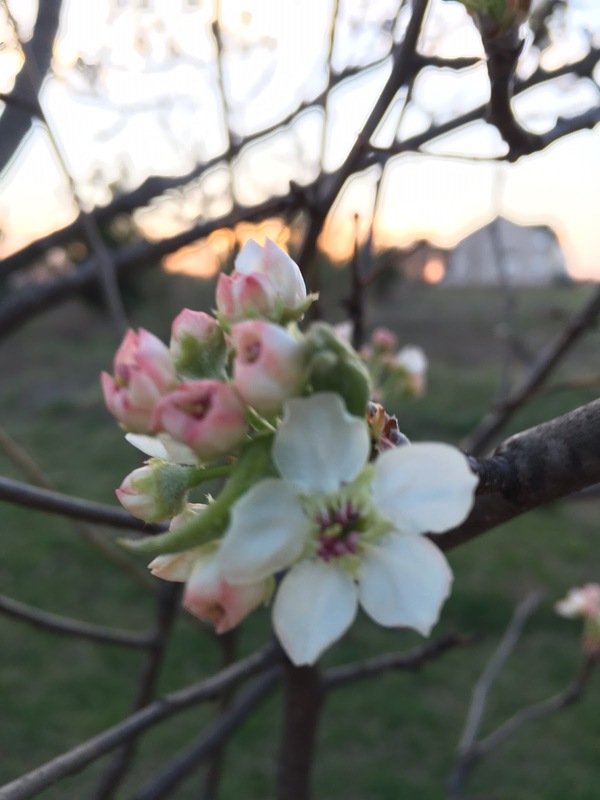 The buds on Monday evening – so small & bright pink! I spent a chunk of my lunch break on Wednesday trying so hard to finish up my parent’s Easter basket. Yes – you read that correctly – I decided I’d do an Easter basket for my parents. They (I mean..the Easter bunny…) have always done so much for Lindsey and I over they years…they still do…and I just felt like they deserved a little something. Even if it was just that – some little somethings! 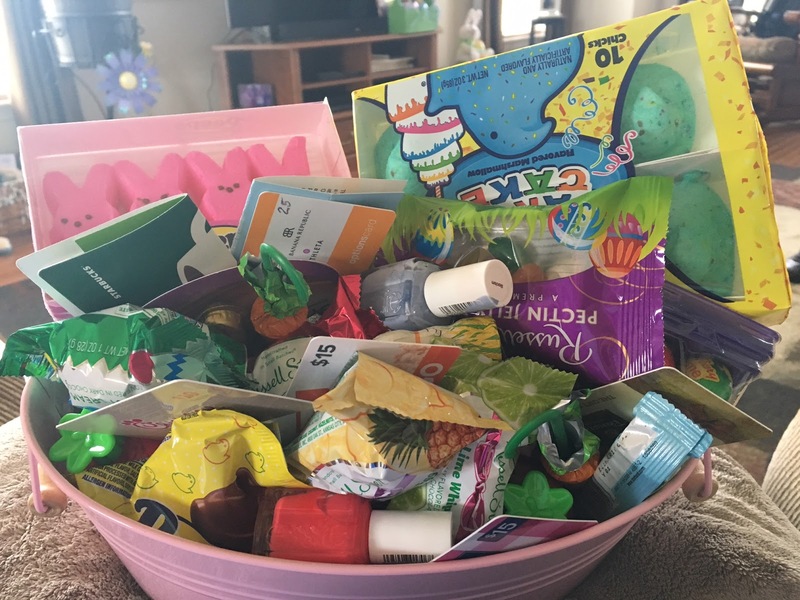 I never realized how hard it would be to find things to fill an Easter basket for my parents…my Dad was especially tricky, but I think I did alright. Lindsey offered up her by contributing some funds and ideas along the way. I raced home on Wednesday a little quicker than I usually do – because finally there was a Nationals game on TV again and I could sit down and watch it! I wasted no time becoming fully engrossed in the game…walking from the dining room table to the TV over and over again lest I miss something…like how I missed Stephen Drew smash a homer when I sat down to eat some green beans. Man! I may or may not have dropped a bite of chicken in the floor at one point because I was so interested in the game; but that’s what Watson is there for, he picked it right up for me! 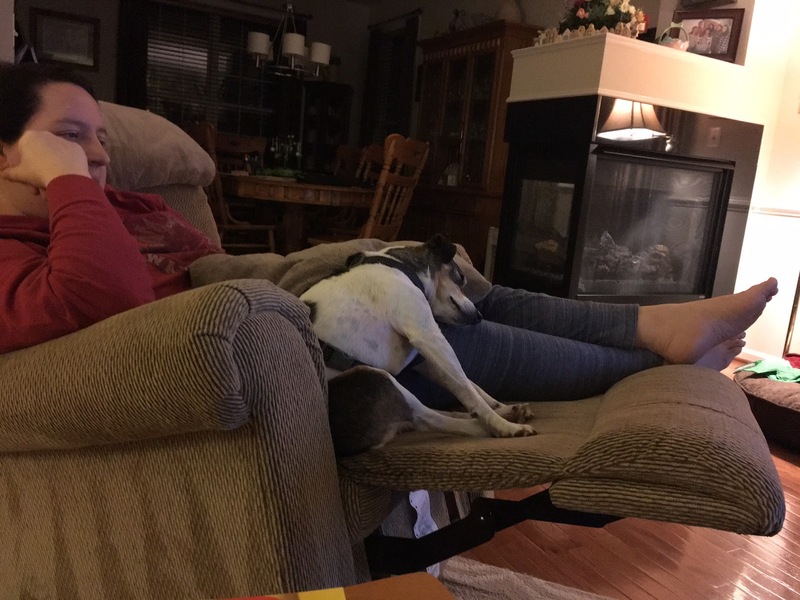 The two of us relaxed in the recliner and watched the Nationals put a hurting on the Yankees – the final score was 13-0 and I’m sincerely hoping the impressive Spring Training performance carries into the regular season…which starts in just SEVEN days! Opening wide on Wednesday evening! Of course, I took more than one picture, ha-ha! 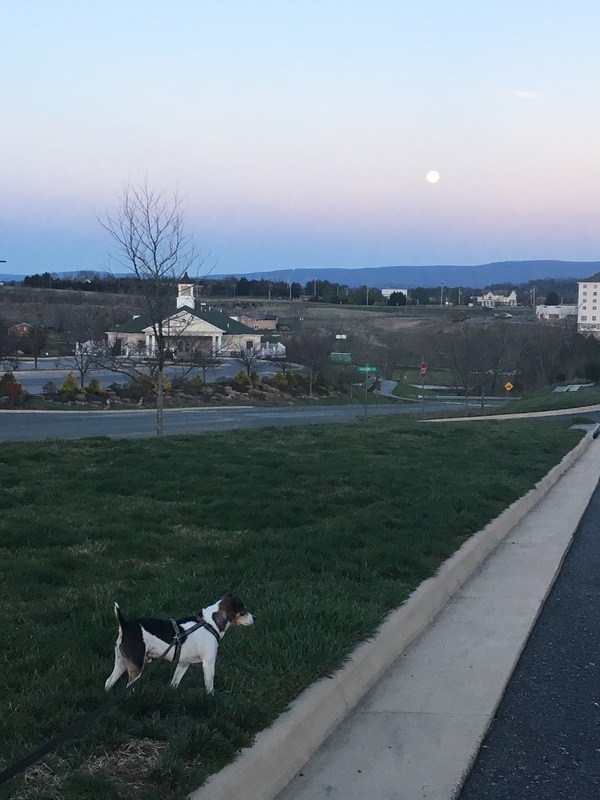 On Thursday afternoon, I got to head home from work early and since my Dad was also at home we decided to go walking together. 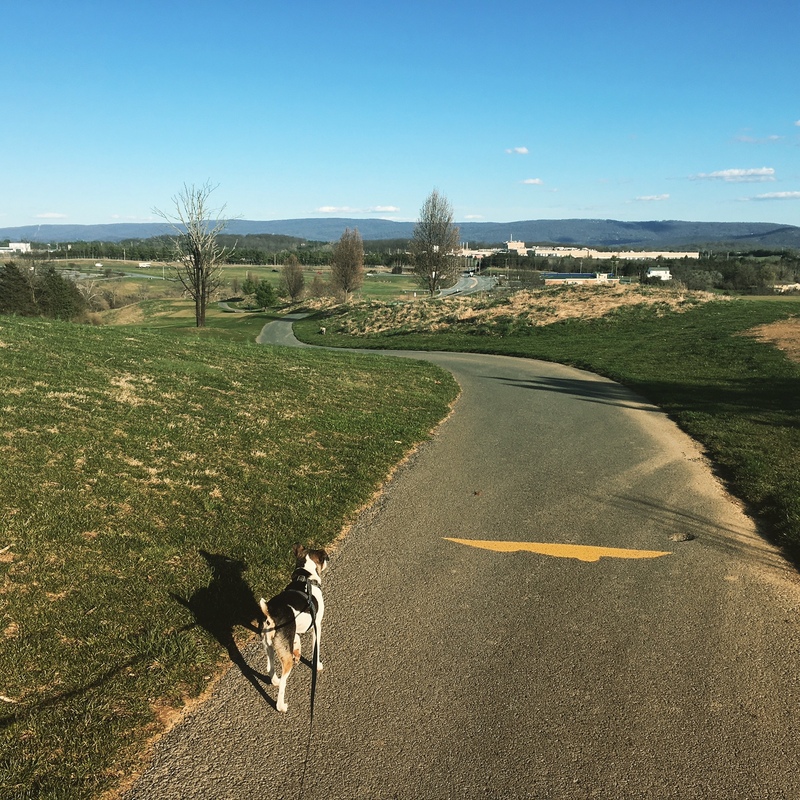 I cannot tell you how glad I was about that – because while we were on our walk, a dog broke free from it’s leash and tried to attack! What followed was Watson’s first experience “flying”…because in an effort to get him away from the dog as quickly as possible, my Dad used Watson’s harness to lift him above the ground. As my Dad lifted, he also turned and Watson went for a little ride above the ground…and his trajectory had to be elevated even more when the dog tried to leap for him. My Dad finally spun Watson around to me and the neighbors managed to grab their wild dog and pull her away…it all happened very quickly…and since I normally scream like a complete lunatic when anything like that happens, I’m glad I managed to keep it together. Ha! I was off work on Friday – always lovely – and after trying desperately to sleep in, I finally gave up and got up around 7:45. I drank copious amounts of coffee, walked the dog a few times and started season seven of Parks and Recreation since it’s finally on Netflix! 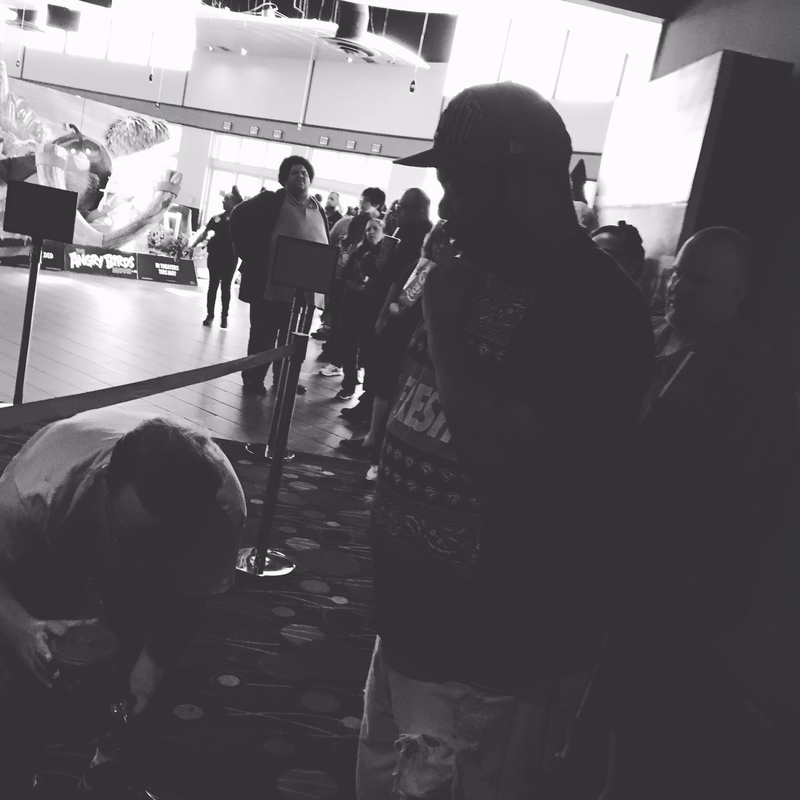 Shortly after noon I left the house and spent the rest of the day at the movies…seriously. I met my friends Danielle and Meridith to have lunch and see My Big Fat Greek Wedding II at the Alamo around 1:30 and when it ended, we all decided to peruse the racks at Old Navy and all found something to purchase – of course! I parted ways with them around 4:30 and met my friend Jennie at the theater at the mall to see Batman V Superman: Dawn of Justice and thankfully we arrived early and “started” the line because by 4:45 (our movie started at 5:20) the line had stretched out behind us and our the door! I really enjoyed both movies – which were obviously about as different from one another as could be – and had a great Friday! 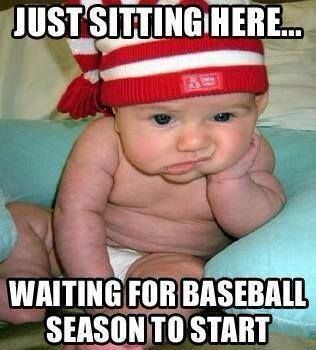 Getting ready for baseball season…ha-ha. The Tulip Library – not well known but so worth a peek – absolutely gorgeous! And of course – just one pink in this bed…. 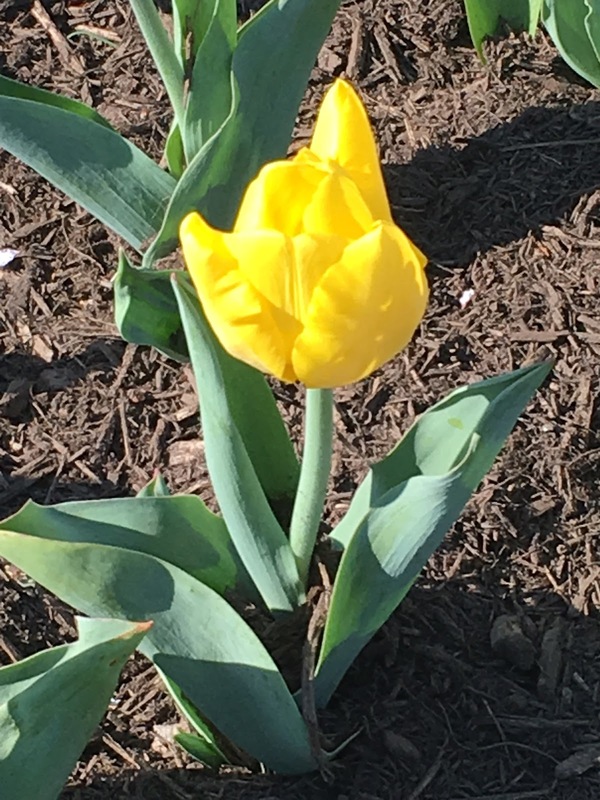 Hands down – one of my favorite pictures that I took on Saturday – of the tulips that is. 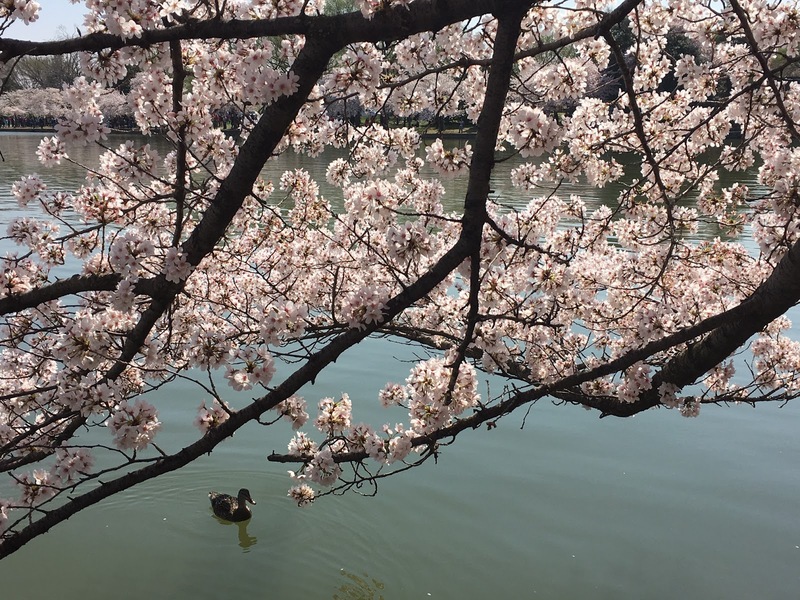 The cherry blossoms bloomed quite a bit earlier than I think they originally expected this year – and I say that only because the huge parade that “normally” coincides with peak bloom is not until April 16th. 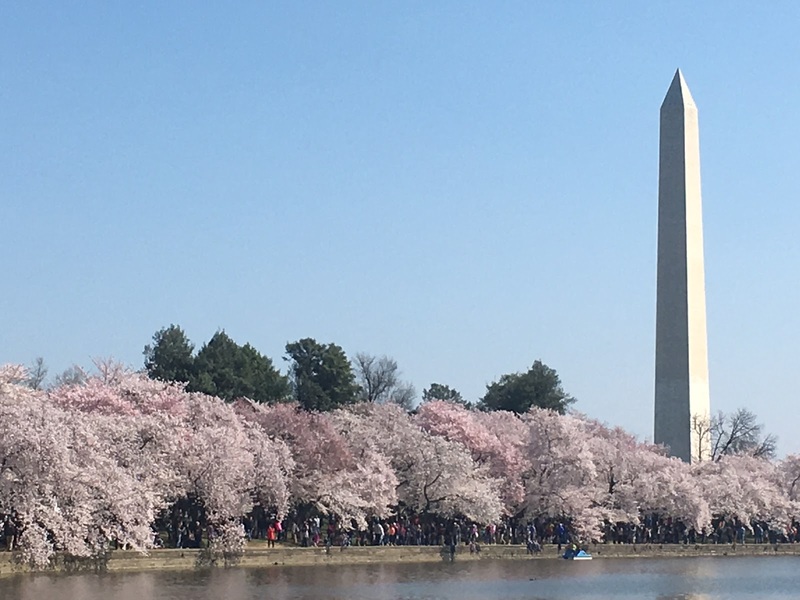 Given that once the trees reach peak bloom, they only stay bloomed out for about 3-6 days, those trees will be completely green by the time the cherry blossom festival parade rolls through town! 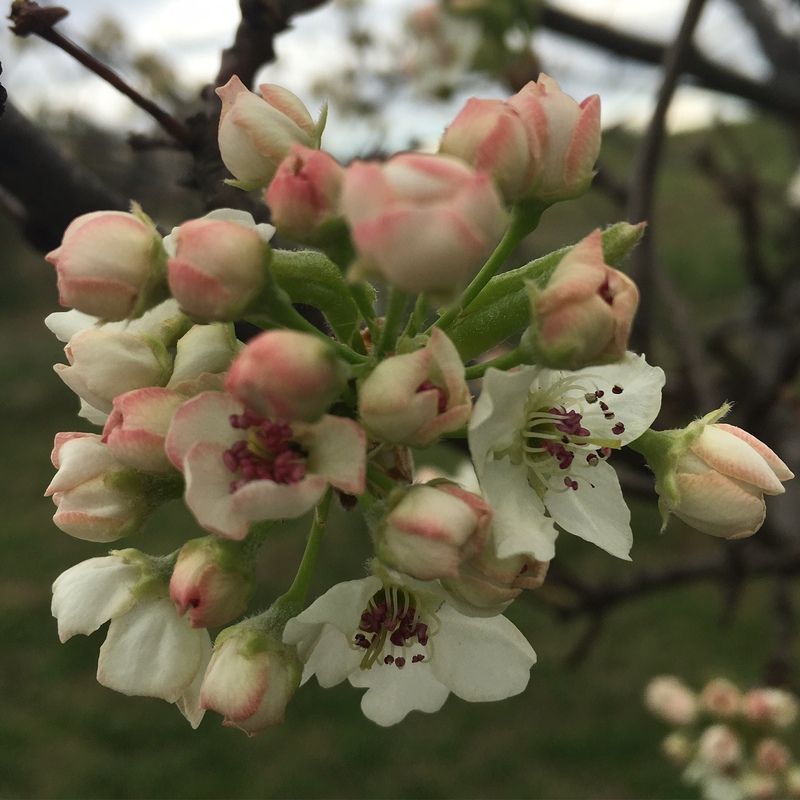 Another thing that seemed to differ from last year – several of the trees seemed to be much more pink this year; a majority last year were pale pale pink or even white, this year I saw a lot more color! Case in point – how gorgeous are these blooms? 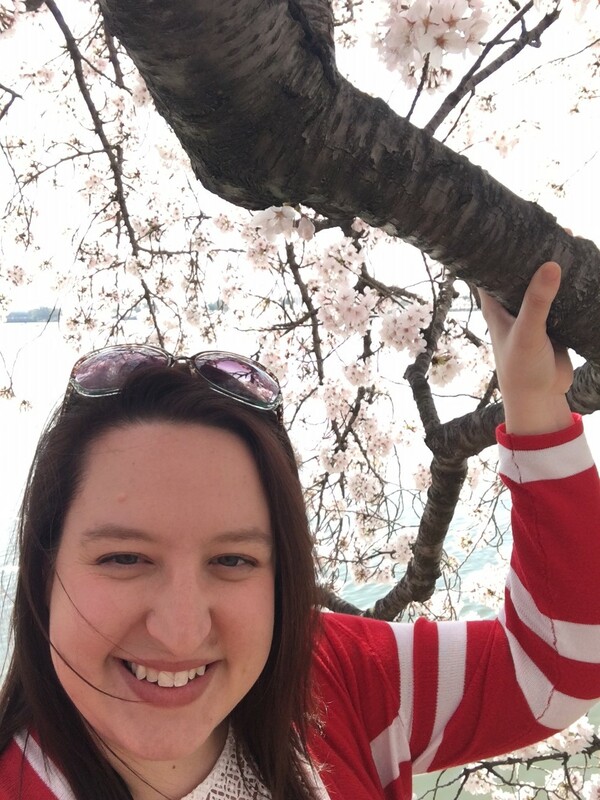 Of course I took a cherry blossom selfie…but the sun is so bright, you almost can’t see the blooms! Absolutely the most gorgeous – I love seeing these trees. A small monument noting the original gift of the trees from Japan to the US. Of course, before we headed back toward the mountains I insisted we visit the “gift shop” that was really a couple of tents set up on one side of the Tidal Basin. 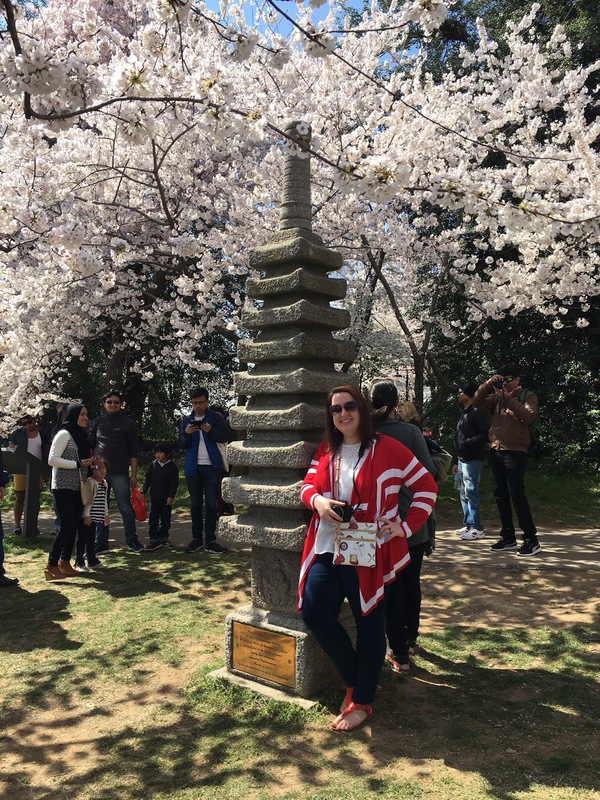 I had spotted several people (all women) wearing cherry blossom antennae and my thirty-one year old self just had to have some…if only to satisfy the six year old that lives deep inside! 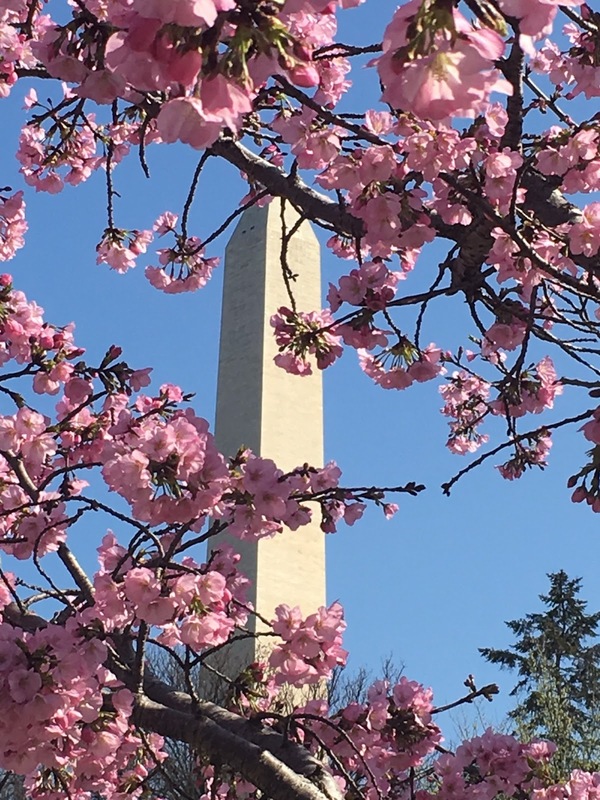 Now, you might think it was very tourist-y of me to buy cherry blossom antennae (and a pen…and a luggage tag…and an ornament…) but I must confess; I hope I always maintain that tourist-y sense of wonder when I visit DC. I’ve discovered in the almost two years that I’ve lived in the DMV (because surprisingly, the county I live in still falls into those parameters) that people either love or hate DC…there is really no middle ground. I fall into the former. 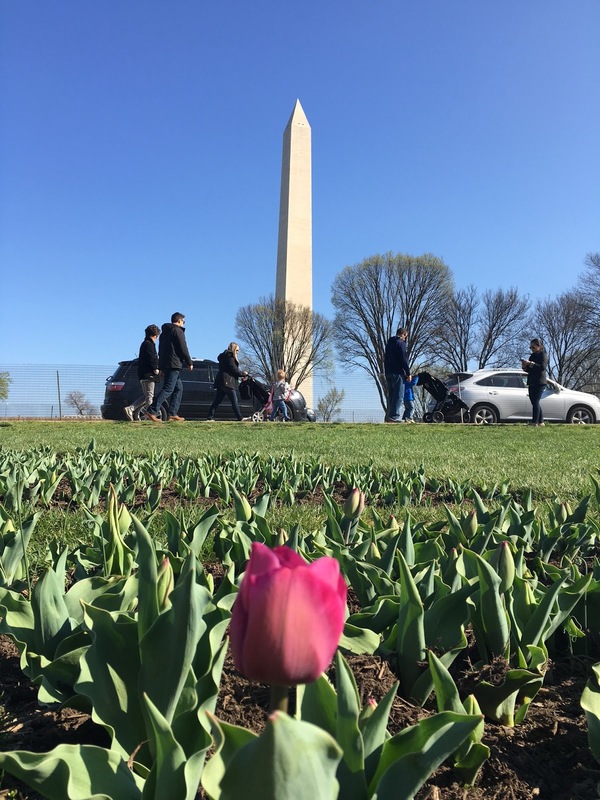 I can honestly say from the first time I visited DC as a small child, I was enchanted and that hasn’t changed…except to probably become more prominent since I can simply hop in my car and be in the city center in about an hour (depending on traffic). The monuments are majestic to me every time, the pace and excitement of the city are infectious and there is just something about the city that draws me in every time! 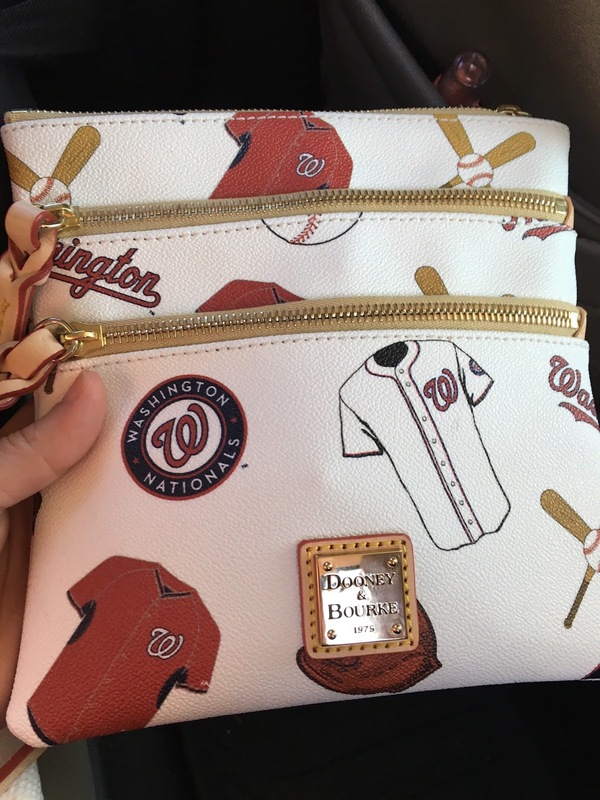 I feel quite certain my long standing love affair with DC might be why I’ve developed a love affair with the Washington Nationals as well and I hope that feeling of awe, excitement and yes…tourist-y fascination…I hope it never wears off. 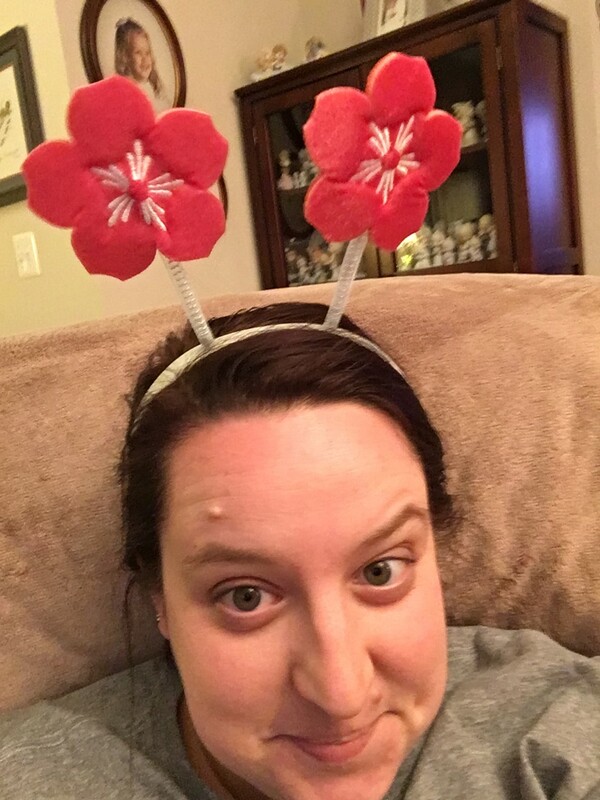 Every girl needs a nice pair of cherry blossom antennae for special occasions. Ha! On Easter Sunday, my parents accompanied me to my church for the 8:30 service – they had nursery at their church later in the day, so this gave them the opportunity to go to a church service but then also go to their church and serve in the nursery. 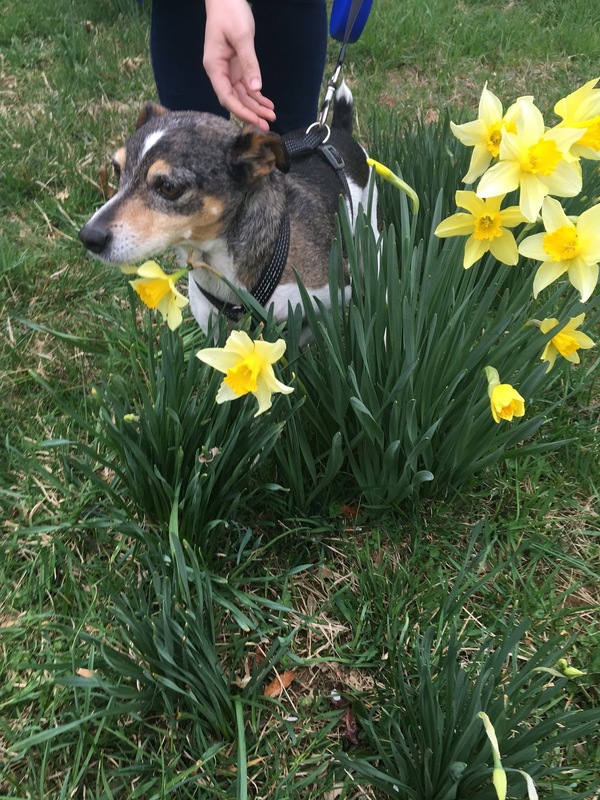 Plus – I had someone(s) to go to church with on Easter! A win-win situation in my eyes. After church ended, we changed and went to a rather lackluster brunch at the Hotel Strasburg. It was definitely one of those “oh well, you try it and learn” situations; we’ll be looking elsewhere for our Easter eats in 2017! We took Watson and headed over to the Arboretum, pretty sure that tons of things would be in bloom…I mean, DC had been positively exploding with plant life the day before… Apparently being just that much closer to the mountains meant that most of the plants at the Arboretum hadn’t quite gotten the memo about blooming yet. Between that and the skies being overcast and the wind getting whippier and whippier (not a word – I know – but hey, that’s fine) it made for an interesting afternoon stroll. Watson though – he ate up every second – and that’s what matters. 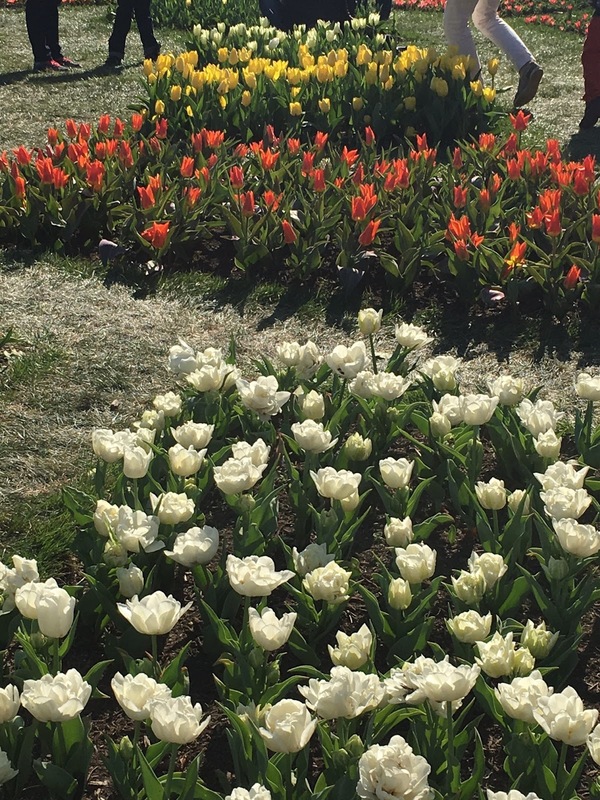 This is my attempt to try & recreate the greatest tulip picture ever…& he was having none of it. 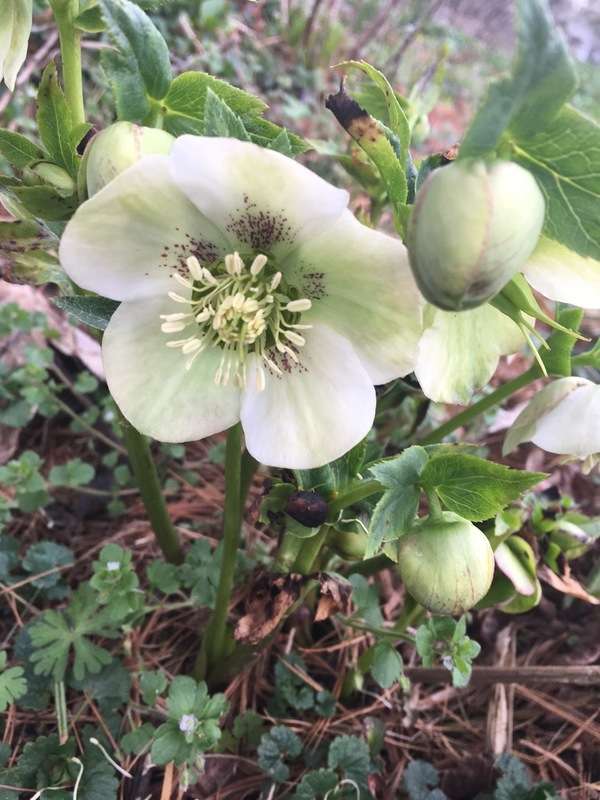 Hellebore – one of the few things in bloom. One of the small daffodil patches we found. 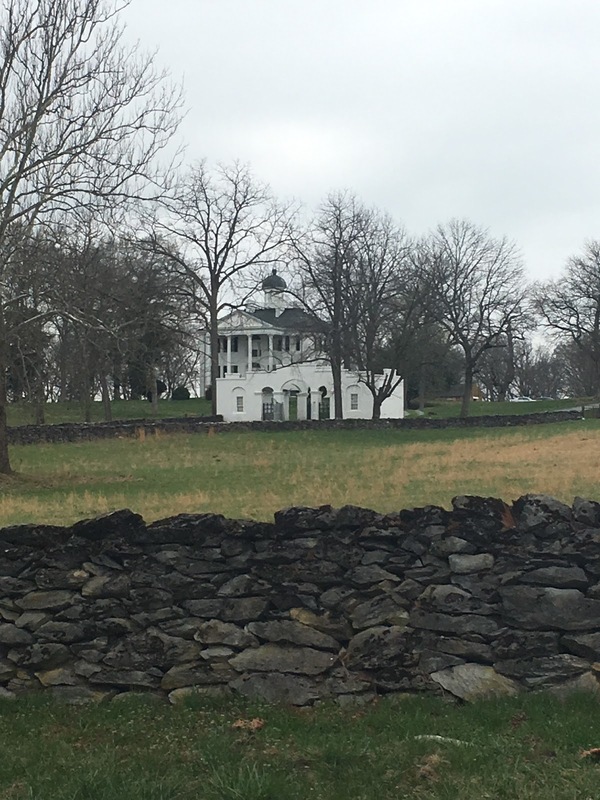 The Tuleyries – one day I’d like to sneak inside. Or I mean…just go inside. Maybe no sneaking involved. 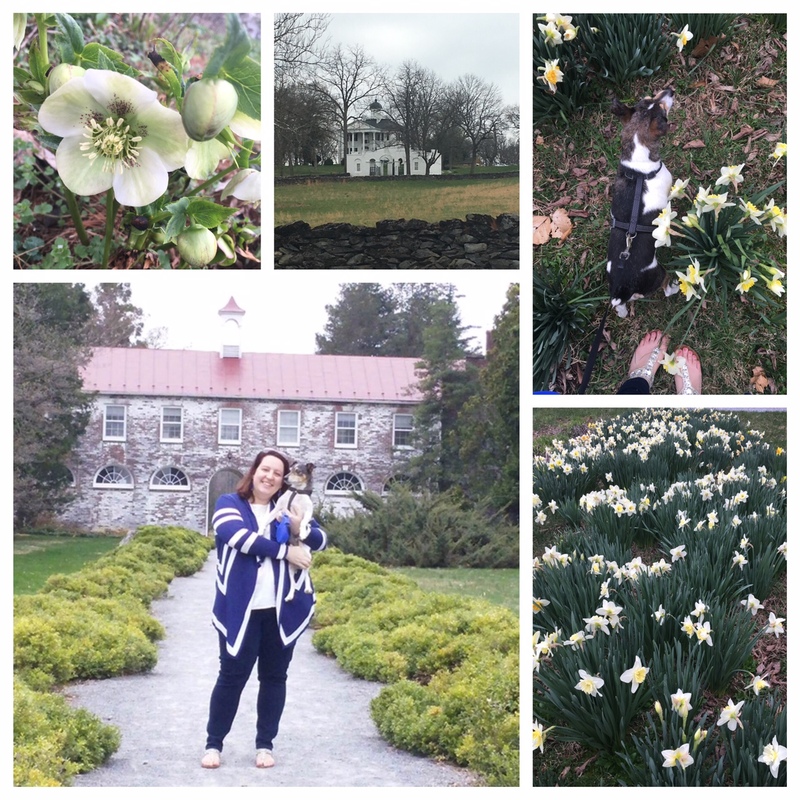 And then…because the three day weekend was filled with so much goodness and wonderful things and adventures… Once we came home, I had macaroni and cheese, ate some Easter chocolate and was asleep before 10 PM. Because mostly, that’s how I roll and also because sleeping is also something I really enjoy. Ha-ha! Photo collage to end things off right! Friday is here – and it’s good. Literally. It’s Good Friday and this post is coming to you…well, not from my desk. My office is closed today and this edition is coming to you from the comfort of my home. I don’t know about you, but I have big plans to thoroughly enjoy my weekend and I hope you do too! One. Baseball…is literally just around the corner. Nine days to be exact. Nine days until Opening Day for the 2016 season and just fifteen days until I am once again at one of my favorite places on Earth – Nationals Park. I spent a good chunk of Wednesday evening (finally) able to watch a game on TV and loved every minute of it… I can’t wait until there is baseball on almost every night and trips to the ball park are a regular occurrence! Two. The movies, which is where I will be spending a good chunk of my Friday afternoon. I’m joining my friends Danielle and Meridith shortly after lunch to see My Big Fat Greek Wedding II. When that movie ends, I’ll scoot across town to the other theater to meet my friend Jennie to see Batman VS Superman: Dawn of Justice. I’m thinking it sounds like a wonderful way to spend an afternoon and evening! Three. 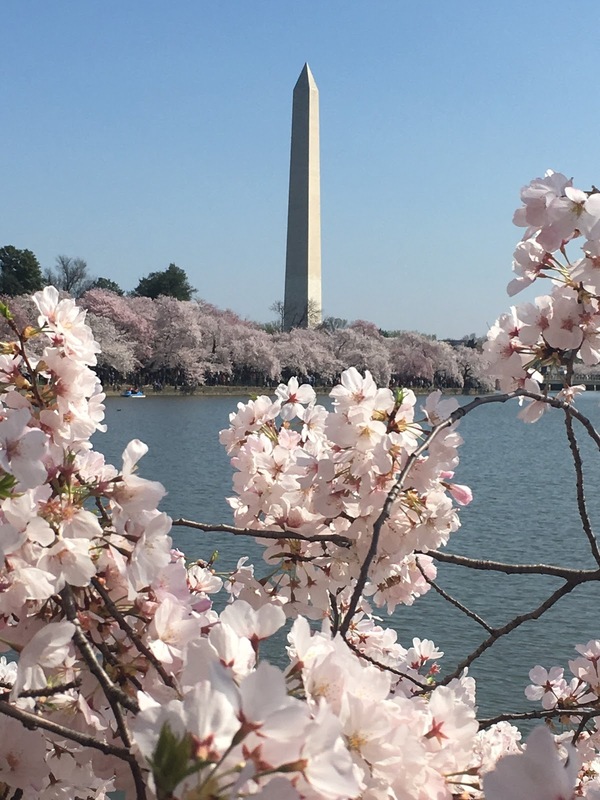 Cherry Blossoms – Because this year they are a peak bloom so early; as in, this weekend! 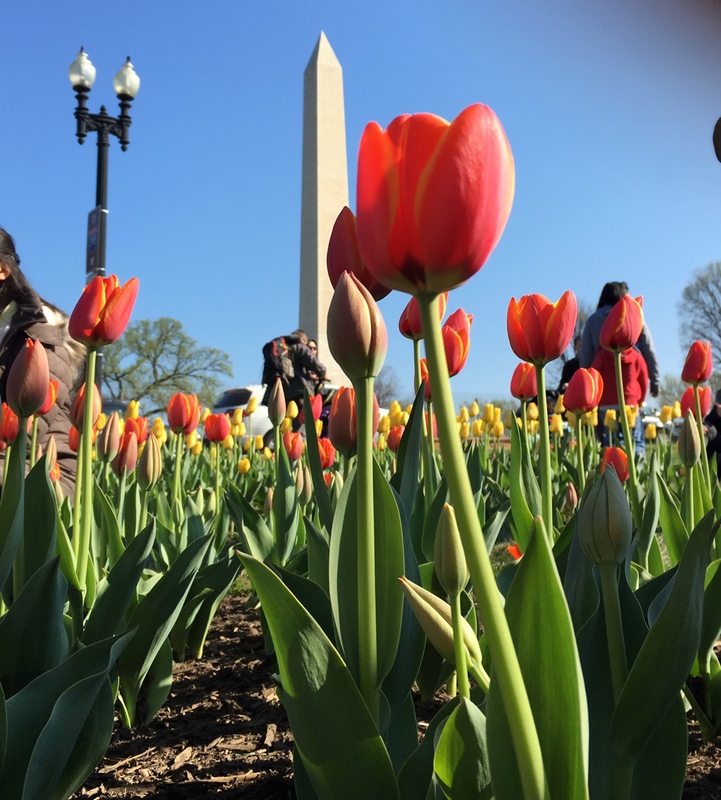 In fact, they were at peak bloom on Wednesday the 23rd and peak bloom usually lasts about 3-4 days, so we are cruising into DC on Saturday to check out those beautiful blooms! Here’s hoping that the rain on Friday will only help the blooms and not hurt them… Seeing them in person last year for the first time ever…definitely an experience I won’t forget. I can’t wait to see them again! The blooms as of Wednesday, March 23. Four. 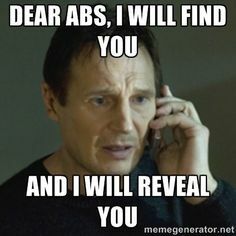 Fitness Friday…and I actually have a lot to report this week! I am back at this week…conquering more miles each day. 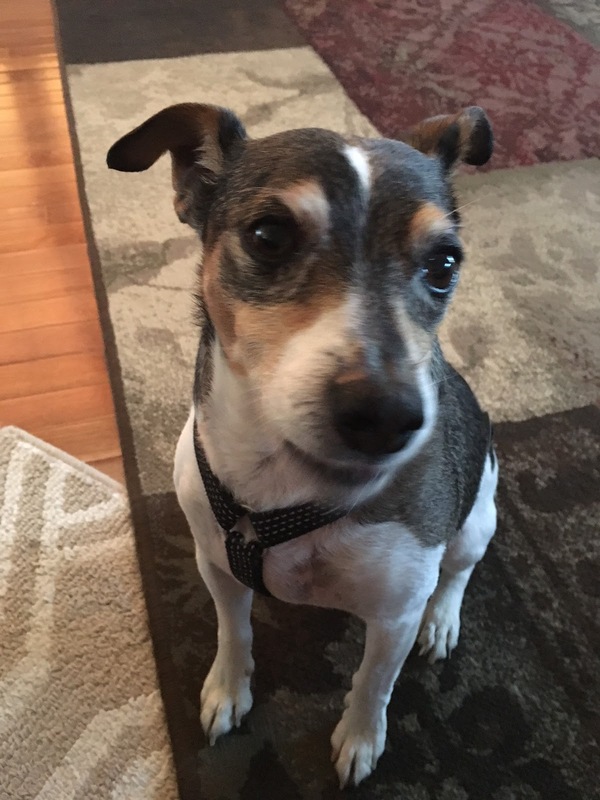 Well, okay…I did 1.5 miles on Monday, 2.15 on Tuesday, rested on Wednesday and then….because I was walking with my Dad on Thursday afternoon…we did more than 2.15. Ha! I also took a huge leap of faith…in myself…and signed up for my first 5K on Wednesday. I’ll be doing the Bubble Run in DC on August 13th with my friend Danielle. I’m excited but already a little nervous. Eek! I guess I better keep this whole fitness thing up, right? Or at least make a pretty concentrated effort…right? Five. Easter is this weekend. I know Easter can mean a lot of different things to different people, but for me it’s not about the colored eggs, the jelly beans and the chocolate…although those are all really wonderful. Easter is about celebrating the Risen Savior and the promise of eternal life that His sacrifice bought for us on the cross. I know I am so unworthy of the love and grace that the Lord has shown for me – but then, grace is a gift that you receive even if you are unworthy. And Jesus is certainly in the business of giving grace; a gift that I’ve receive daily in my walk with Him. And that’s all I’ve got for this Five on Friday! If you want to join in on the fun, just copy the logo that I’ve posted at the top of this page and then use the linky tools on Christina or April‘s blogs to join in the fun! I hope everyone has a wonderful weekend and a very happy Easter! While we were recently in Mississippi for a few days, Watson went on a little “trip” of his own. 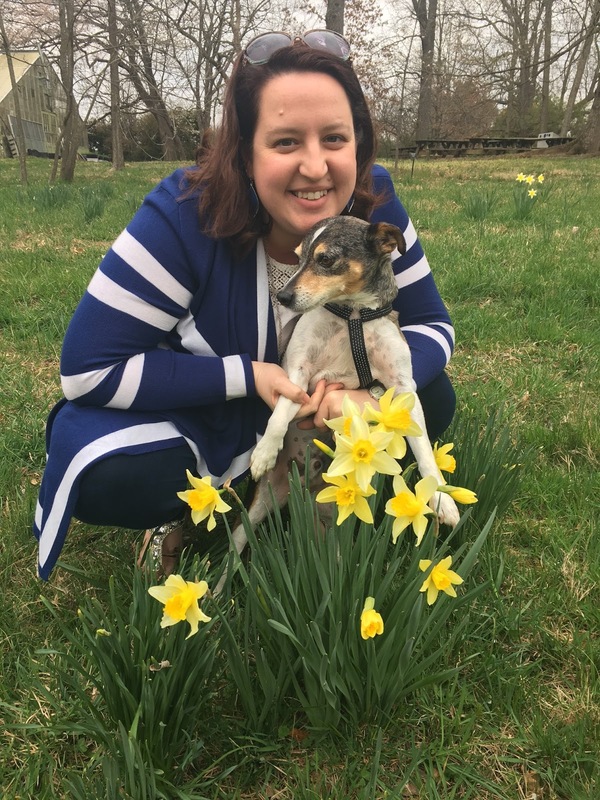 One of the challenges of moving away from my extended family is that I don’t actually have a built in pet-sitter…which meant I had to find a kennel that I felt comfortable leaving my precious pup with. Comfortable isn’t really the right word though – because I found Cavalier Kennels and I feel more than comfortable leaving him with the great people at this location. They honestly have a love for animals, spend time with the little critters in their care and I know Watson is being well cared for…which has allowed me to travel all the way to London without having to worry about my sweet pup. One thing I especially love about Cavalier is that they post pictures of the pups under their care on their Facebook page. 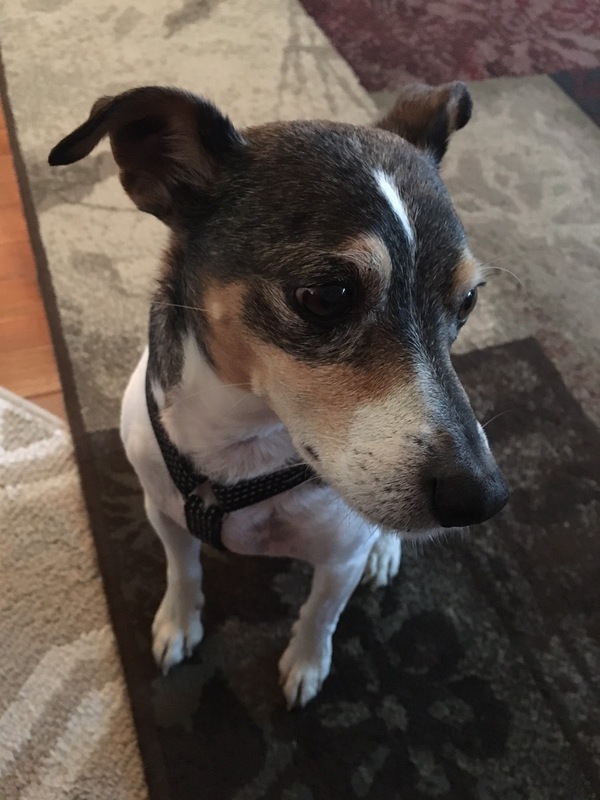 I can peek in on Watson every few days to see his sweet little chocolate eyes and that precious face and know he’s 100% fine – most likely frolicking in the big backyard and having a delightful time. I can’t slow down for a picture – I have running to do. Have you ever left your pet at a kennel? I was definitely unsure about kennels until I found Cavalier and now I hope I’ll never have to look anywhere else! Spring has arrived! The sky is blue, the clouds are full and fluffy…and the wind is whipping around this office with a vengeance! Let me tell you – I took a few more pictures this week…but with a new phone (which I love, please don’t doubt that for a minute) comes the realization that for some crazy reason the app I used long ago to upload photos to my blog apparently doesn’t exist anymore! 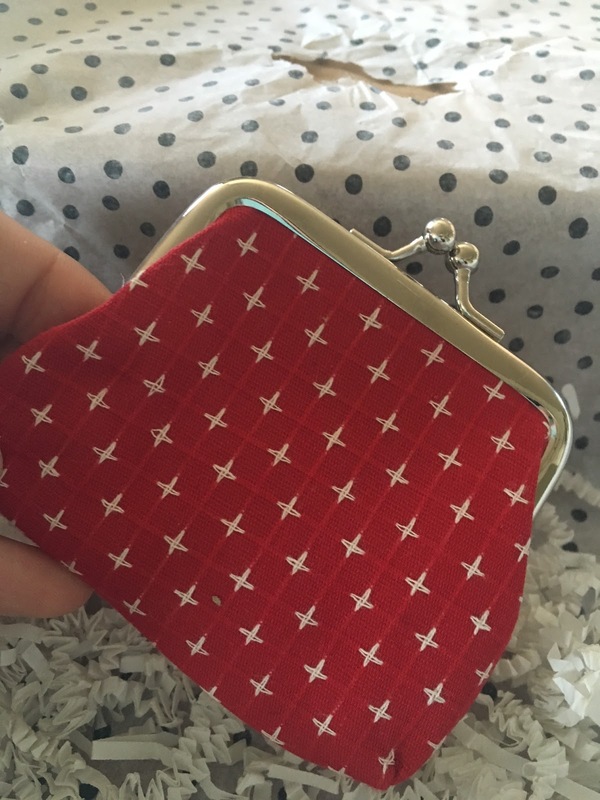 I realize that is a first world problem and I need to get it together…but man, that thing was convenient! Oh well – I’ll stop whining now and actually write (type) about more important (at least to me) things. My week (last week…obviously) began a world away in Mississippi. Seriously, sometimes Mississippi does feel like a whole different world from Virginia…that is neither bad nor good…just how it is. We helped my little sister finishing packing up for her trip to Texas and had some BBQ for lunch at one of those hole in the wall, side of the road places…and it was fine. Nothing outstanding but also not terrible and since it was after 1 before we ate, it was food and I was pleased with that. We all parted ways and Lindsey headed for Texas, while we headed for the Birmingham airport. True story – this was me on the inside. Once we landed, my Dad assured me it wasn’t “that bad”…but yea…I’m still not buying it. I always assume when turbulence occurs that we are literally one swift bounce from total cataclysmic death. What can I say – I’m dramatic. It makes life interesting…and that can be both a good thing and a bad thing. The best part of returning home was going to pick up Watson from the kennel. 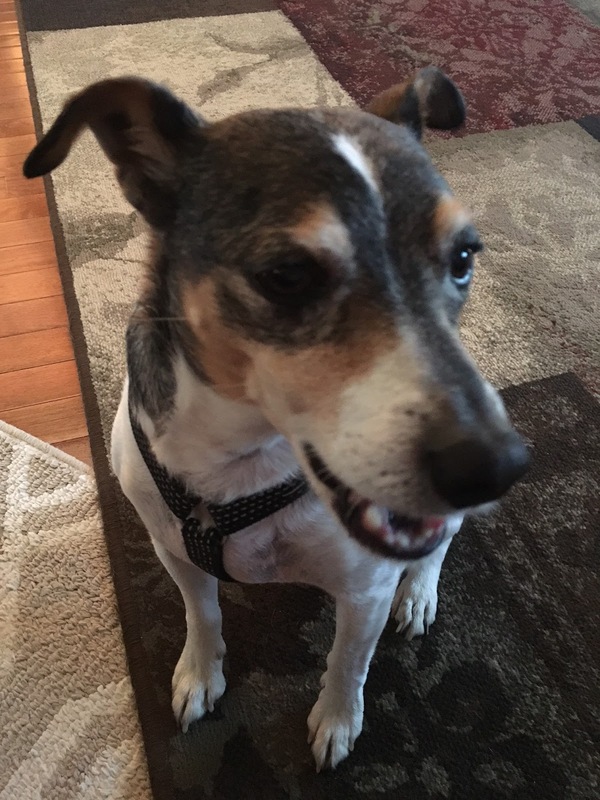 Judging by the pictures that they posted while we were away, he had a grand time frolicking in the big open yard and he seems to charm everyone he meets, so I’m sure he made plenty of (human) friends…but I was thrilled to go get him on Tuesday morning. He was likewise thrilled to see me, running in circles around the room and hopping around…which certainly makes my heart happy. 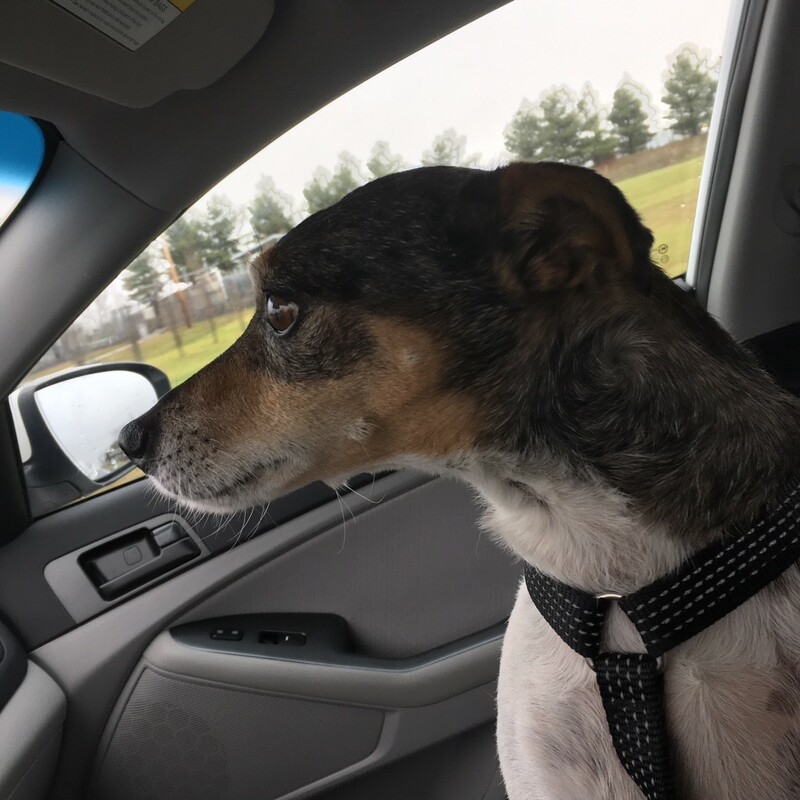 In his excitement he did almost tangle himself completely around the legs of the sweet girl he brought him out to me…but we avoided catastrophe and made it home in one piece. The birthday boy and his goods! One of the sweetest faces…in my humble opinion. 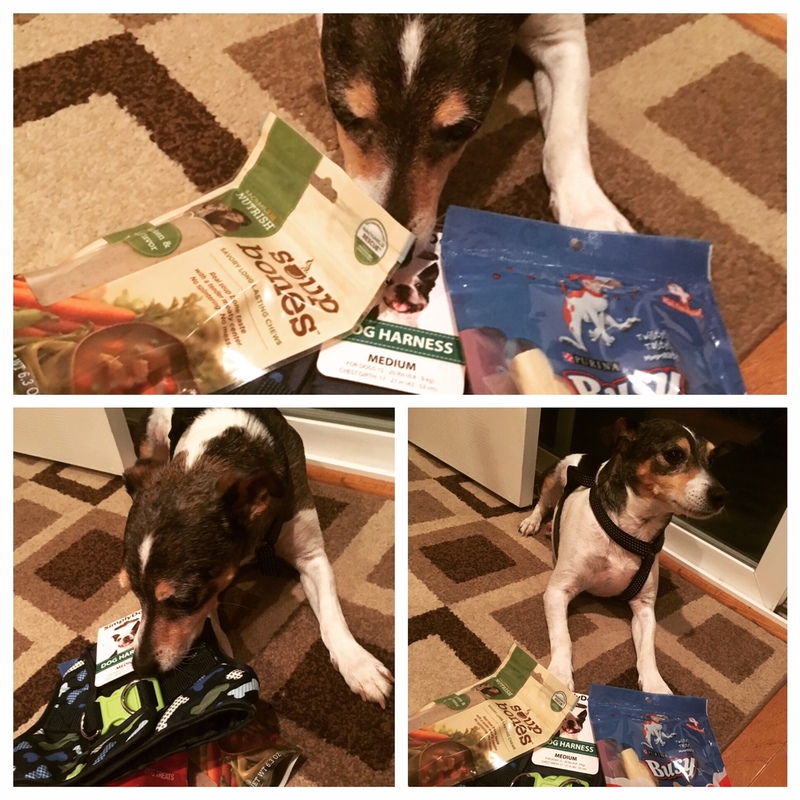 Tuesday was Watson’s eighth birthday and so I rewarded him with some delicious treats and a new harness…which won’t snap around his muscular chest. So…oh well for that one. 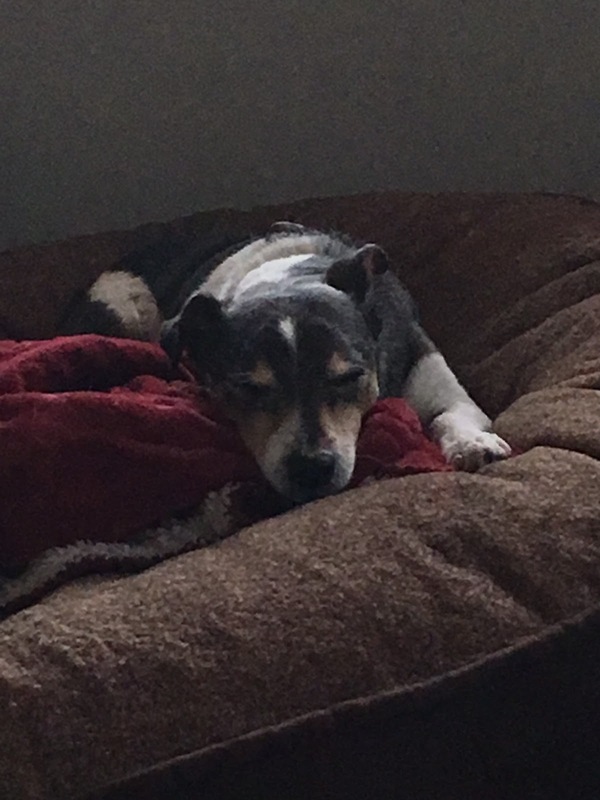 He spent most of the week being impossibly adorable but that’s really nothing new, it was just extra endearing to me since I’d been parted from him for a few days. The weather all week was pretty glorious and wonderfully warm; I was able to wear sandals all week long and really, that’s a win for me because I love (and own) way too many pair of sandals, so I need as long as possible to have the rotation in effect. 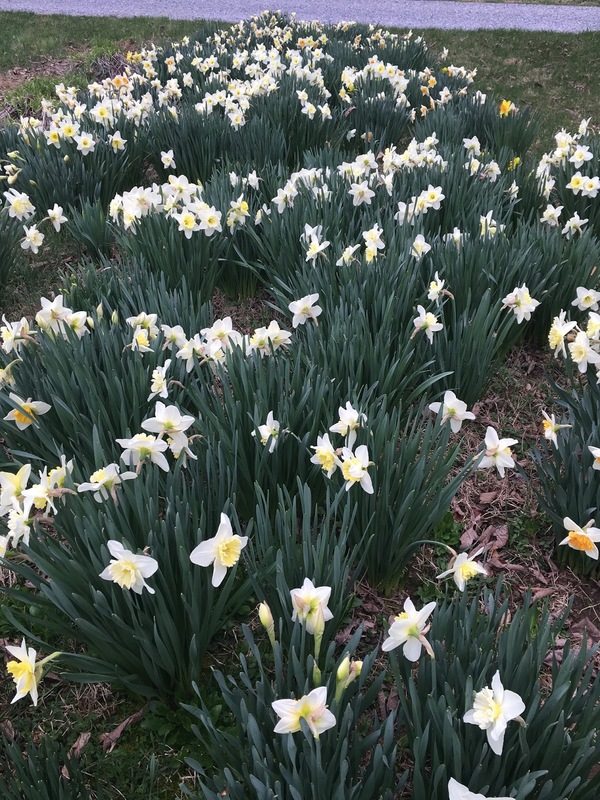 The warmer weather – I have discovered – in Virginia brings out something in me that Mississippi Springs never quite did. It would seem that this climate causes me to have allergies aplenty and this new(ish) development sent me in search of something that I could take to alleviate the pressure in my forehead. The kindly Target pharmacist was ever so helpful, handed over the good stuff and all I had to do was sign some thing saying I wouldn’t go home and made meth with the meds. I think we’re safe on that count – so to that I say, hallelujah for relief! 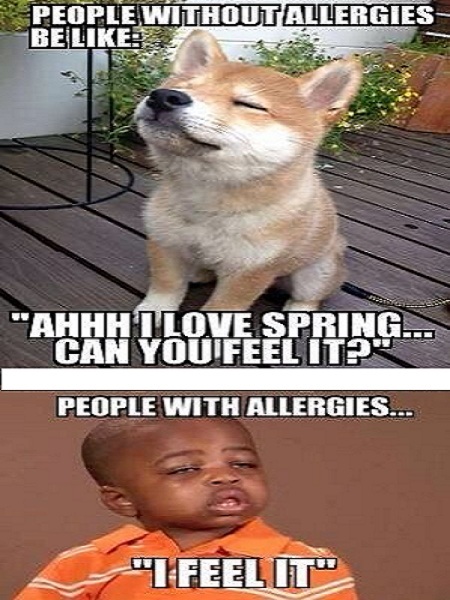 I feel your pain little guy…. Sometimes Thursdays are just really hard and you need to sit with your Momma. 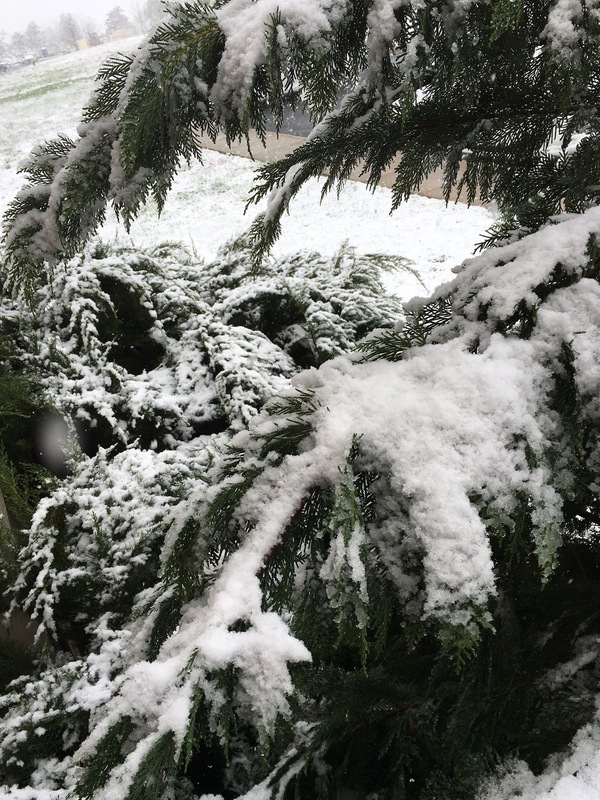 The rest of the week was uneventful – except for when I looked at the weather and saw that snow was forecast for Sunday. What a horror that was. I just can’t have the first day of Spring being marred with snowfall… But I’m getting ahead of myself. 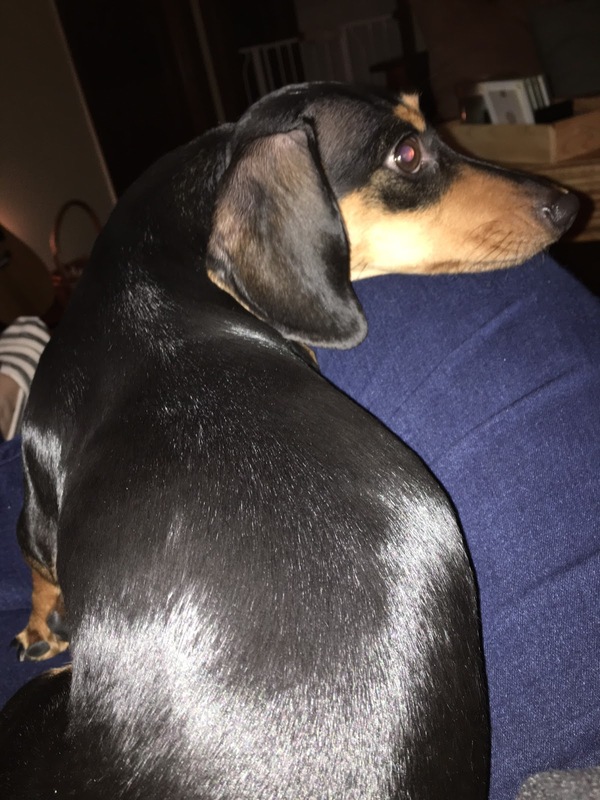 I passed a chunk of Friday night with my friend Katie and her two adorable weenie dogs, Lola and Cooper…we watched a movie and YouTube videos and drank wine and just had a generally splendid time. 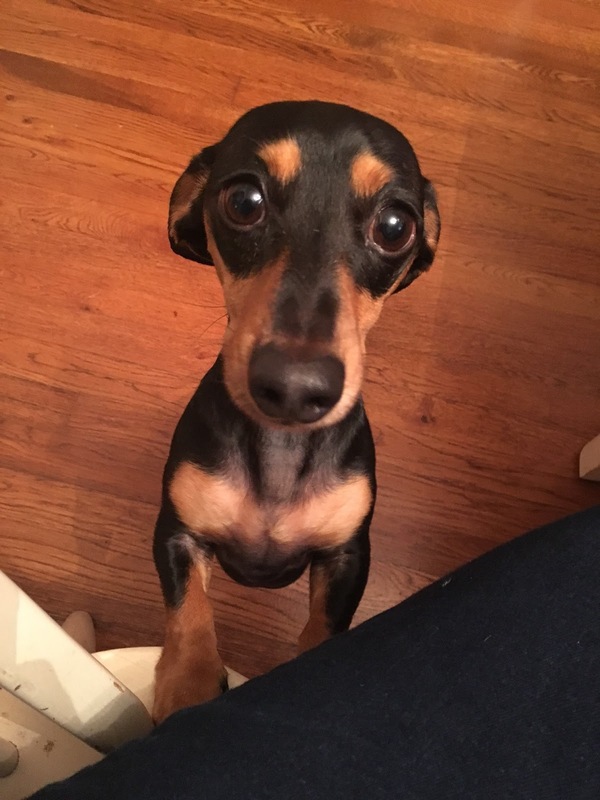 Her sweet little weenie dogs begged for bites of supper…just like Watson does, but Lola might have had a better sad puppy face. They snuggled a little with me on the couch too and were just generally precious. A poor sad weenie dog….ha-ha! The weather adjusted itself a little bit and Saturday morning dawned gray and chilly…and rainy! I was thinking we’d maybe made it out of the woods and wouldn’t be dealing with any snowfall but around eleven the rain changed over to snow…and it was thick, heavy and wet. Gross. My Mom and I made a quick trip to Walgreen’s and Lantz’s Pharmacy in the wintry mix of nastiness and later in the day we all made a Wal-Mart run but for the most part, we hunkered down for the day – nothing actually stuck to the roads (thank goodness) but the snow was such a mess and definitely not the kind of light and fluffy stuff that is fun to be out in! Sometimes you just need lazy weekends though…so I was fine and dandy with just putting on cozy pants, a snuggly sweatshirt and socks and joining my parents as they finished season four of House of Cards. Seriously – talk about a grand finale! 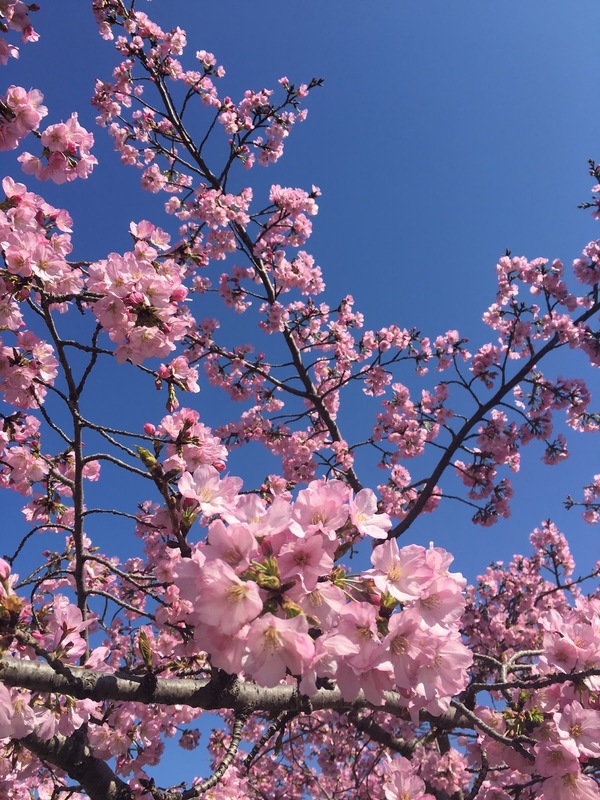 I also ventured a try at Starbuck’s Cherry Blossom Frappucino on Saturday – riveting news I know – and also, who doesn’t love a cold drink when it’s snowing? 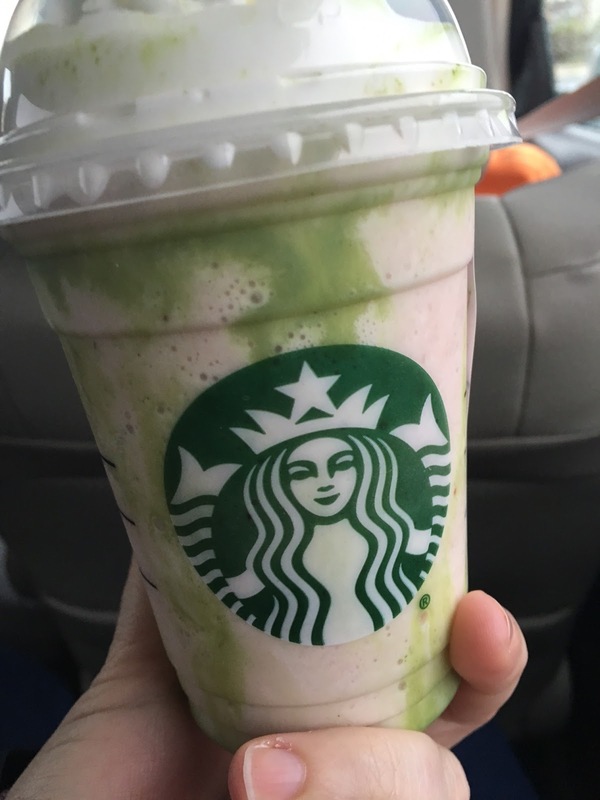 The irony of the Cherry Blossom frappucino is that it’s actually made with strawberry sauce…so I don’t even know about all that. However, what I do know is that it was so sweet it made my teeth ache. Yikes. Pink & Green & sweet as liquid sugar. Whoa. Sunday was blustery and gray and ended up being another lazy day. Two weeks ago my Dad and I had gone on an expedition in the basement to find my box of Spring/Summer clothes so I could swap out my closet…but we’d had no luck finding them. My Dad was of the mind that things get put in the basement and disappear and while I was inclined to believe him (about some things at least…) I knew they had to be somewhere. Of course, on Sunday afternoon I opened up the closet in the guest bedroom and noticed the large box in the corner of the closet…that happened to be my Spring/Summer clothes. Exactly where we put them last September. Oops. Oh well, at least it allowed me to change out my closet…realize I had way more Fall/Winter clothes than Spring/Summer and also allowed me to liberate quite a few hangars in the process. I figured since Winter had made it’s final stand on Saturday, Sunday afternoon was as good a time as any to update the closet – if only because in my mind I’m telling Winter it has to go! 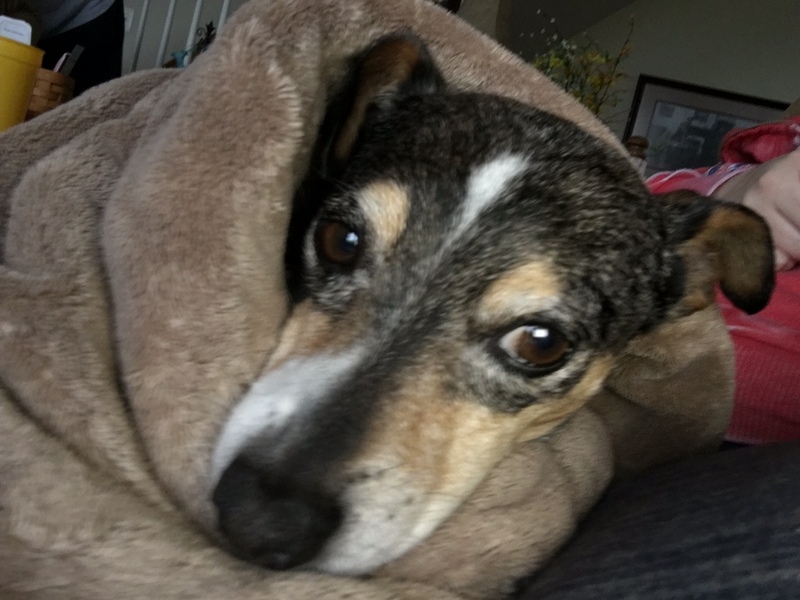 Baths are really stressful and require being wrapped in a blankie like a baby to recover…. I closed out my weekend with pizza, puppy dog snuggles, a bubble bath and reading in my delightfully cozy bed. All wonderful things and a lovely way to end a lazy and restful weekend. I’m already looking forward to next weekend – which will be a long weekend since Easter is this weekend! I can’t even believe it’s so soon this year! I must say though; I’m looking forward to a four day work week, a long weekend filled with friends and plans and of course, hopefully some sleeping late somewhere in there!